Here in the interior of Brittany, the peninsula that is the westernmost part of mainland France, France's Cornwall if you will, is la Brocéliande, the magic land of Merlin and, if you believe the local residents, King Arthur's Round Table. This mythic brotherhood, the original Camelot, is located somewhere in the West of England or somewhere here in Brittany, depending on who is doing the telling. Merlin's grave can be found here, and we left a bottle of wine there once, as can collections of stones pre-dating Christianity and land that really does feel ancient and disturbing. La Grée, Grand-père's cottage where we like to live summer's tranquility, is just on the edge of la Brocéliande. So we visit most summer vacations, and periodically play tourist. Which of course we are not! We have family there. 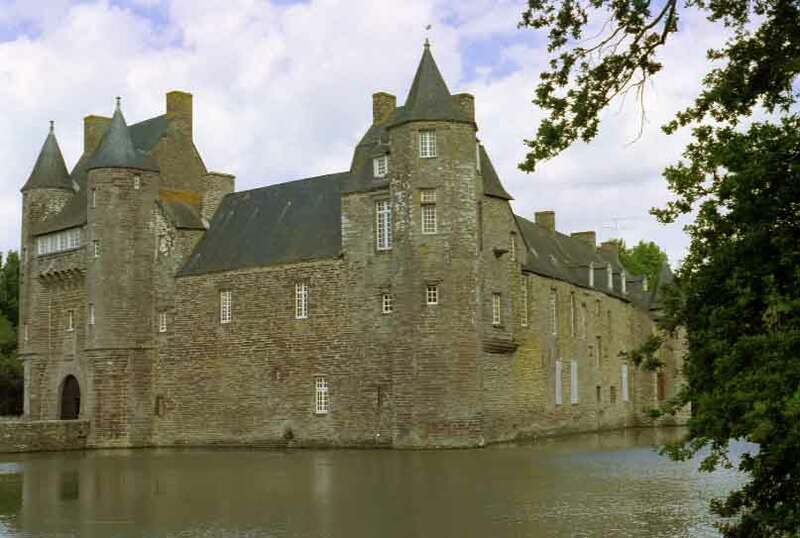 On the left is the medieval Chateau de Trécesson, still privately owned and in magnificent condition, at least if seen from the outside (we've never had the privilege of going in). It is off the beaten track, and although it is signposted, we may not have found it (during the summer of 2004) if Grand-père had not shown us the way. 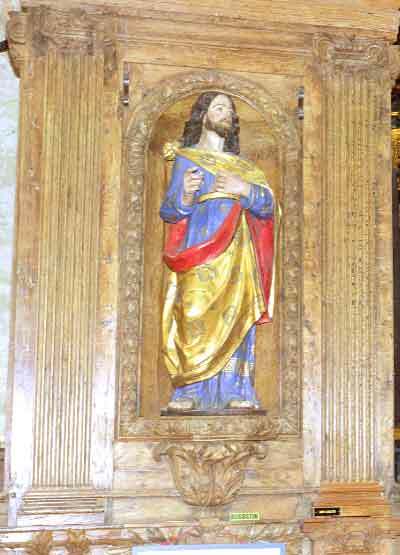 On the right is a wooden statue of St Augustine, currently (summer 2004) being refurbished in the Abbaye de Paimpont, not far from the Chateau and just as medieval. The Abbaye was founded in the 6th or 7th century, destroyed by the Vikings in the 11th century, and rebuilt and modified periodically thereafter. Its site is on a lake across from a pagan place of worship, perhaps co-opted by the early monks. 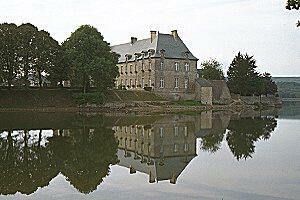 Here is a shot of the exterior of the Abbaye taken from the internet: http://farfadet.home.free.fr/paimp4.htm Merci! Amidst these splendid and powerful edifices is one which attracts us even more. 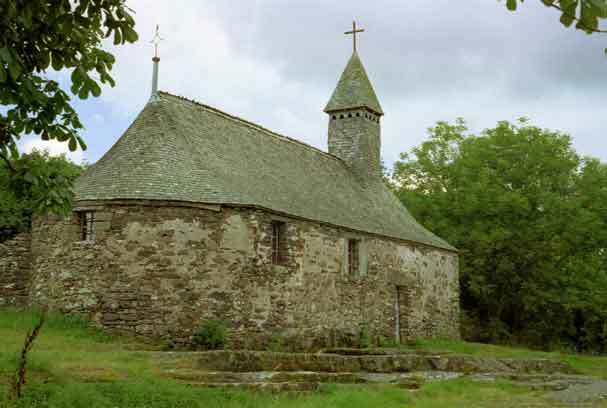 A tiny little chapel, la Chapelle de Saint- Jean de Jérusalem, is buried in the woods off the beaten track in the forest of Paimpont. As its name suggests, it was founded by the knights templar or their "hospitalier" (or charitable) cousins.  It has stood for close to a thousand years, and it would fit on the ground floor of our home. 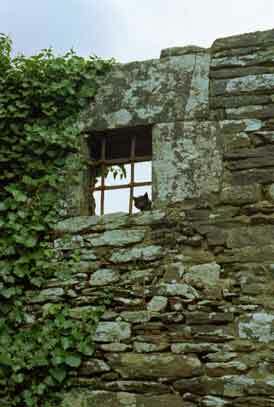 Below on the right is the cat who welcomed us to the Chapelle in August 2004. And below on the left is the Chapelle, sitting modestly on the granite as it has sat for a millenium. This is history, reassuring certainly, but also at times it feels more than a little sombre. Vacations in the present day include Disney and New York. Our other vacations with the land include Death Valley, Yosemite and Colorado. La Brocéliande is the real thing.